To the budget project’s admirable work, I'd add just one thing, a bit of broader context. The kind of incremental, technocratic reform offered by Prop 31 is not the cure for California’s governing dysfunction. It is the disease. In California Crackup we tell the story of how California, constitutional amendment by constitutional amendment, initiative by initiative, has built the strangest and most radical form of government on the planet, the Winchester Mystery House of government. That process has accelerated over the past several decades, as political entrepreneurs have learned what Howard Jarvis taught: that the initiative could help make you famous and powerful. The results have not been pretty. The tsunami of initiatives has left the legislature with a narrowing scope of action and dwindling flexibility to deal with the state’s problems. This has created a cycle of contempt. As the loss of flexibility makes the legislature less effective, more groups and wealthy policy entrepreneurs take to the ballot with more measures to make the legislature even less effective. Many of those initiatives have been something-or-nothing measures widening the state’s budget deficit and authorizing more debt. Prop 31 continues that destructive tradition. It fastens badly crafted pay-as-you-go chains on the legislature but not on the initiative process. Anybody who has thought for even a minute about what’s happened in the state over the last generation can predict the likely effect of this kind of one-sided restriction. Those who want to create new programs or cut taxes without offsetting budgets changes to avoid adding to the state’s deficit will turn even more often to the initiative process, where voters have proven themselves far less inclined to exercise fiscal discipline than the people they elect to office. By exempting bonds from the pay-go provisions, the measure would only make borrowing more attractive and feed the state’s debt habit, which has made debt service the fastest-growing part of the budget, as CBP points out. And here’s the greatest irony: Prop 31 is a something-for-nothing measure itself. It exempts itself from the very budget discipline it seeks to impose upon state government. It sets aside hundreds of millions of dollars for its own pet projects of local government cooperation without providing any way to pay for the set-aside. Then again, perhaps “irony” is the wrong word. Arrogance is more like it. The good news is that Prop 31 isn’t likely to fly again. In the Field Poll released this week it has the support of only 21 percent of likely voters, with 40 percent opposed. I doubt that overwhelming opposition comes from voters’ understanding how this monstrosity would work in practice. Even its authors appear not to have given it any thought. 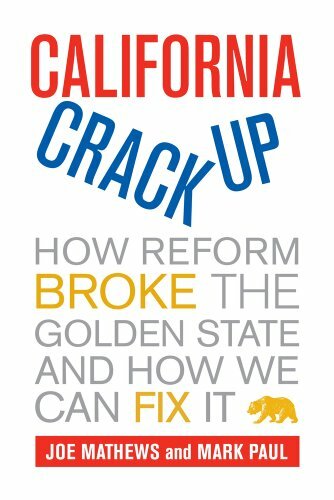 But voters, having seen their state plunged ever deeper into dysfunction by an outpouring of initiatives, may have finally begun to wise up to the danger of elites bearing “reform.” This election may not make California’s dysfunction better, but we may one day remember it as the time when we stopped making things worse.